If you've ever heard that Lonely Island song (and, of course, you have), you know there's no better place to party than on the water. It's a fact; and the main reason we rounded up the best party lakes in the United States. But the key to any good on-the-water party starts with finding the right boat, preferably one you can also fall asleep on at the end of the night. 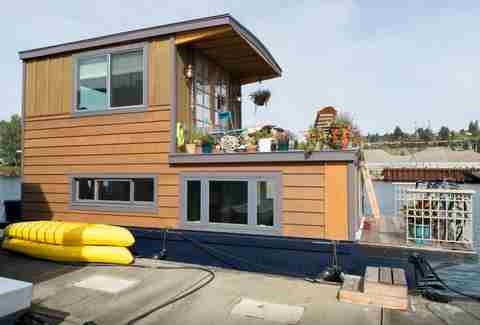 And that's where Airbnb comes in: here are nine of the coolest houseboats listed in the US. Queens is full of secrets, and one of them could (should?) 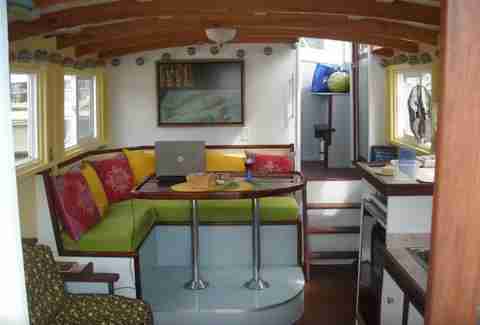 be this funky surfer-inspired houseboat in Jamaica Bay. She definitely lives up to her Bowie-inspired name, decked out in wall-mounted guitars, hammocks, and salvaged driftwood. Just go ahead and "Wish List" this baby right now. 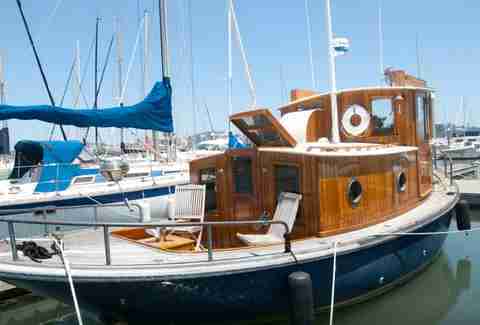 Built in 1908, this elegant tugboat was refurbished a few years ago but still maintains its gorgeous custom teak/birdseye maple interior with bronze portholes and brass fixtures. In addition to the Old World charms, you also get modern amenities like Wi-Fi, a custom mattress/featherbed down comforter, and a full galley complete with refrigerator and microwave. 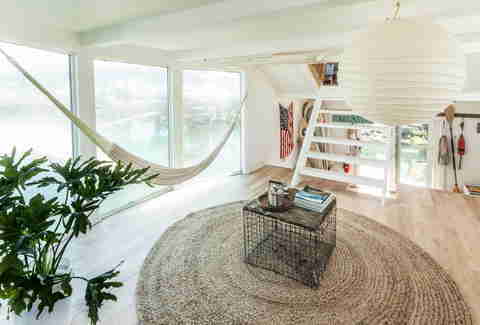 Let's just go ahead and call this Airbnb's most hipster houseboat -- it's got all the touches of a cool boutique hotel except that your room also... rocks and sways. Expect potted plants, vintage furniture, and a lofted bed with "panoramic views of Sausalito Bay." 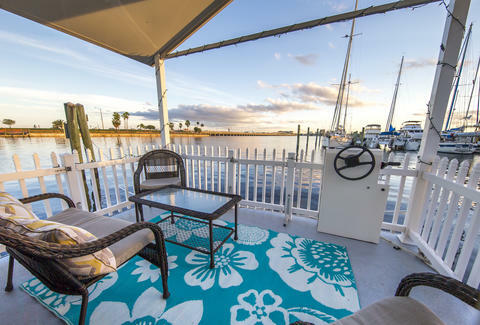 Docked in Florida's biggest live-aboard marina, this fully furnished barge offers access to a pool and spa, gym, and nearby beaches. Also, manatees! And dolphins. Both of which you can watch from on deck. 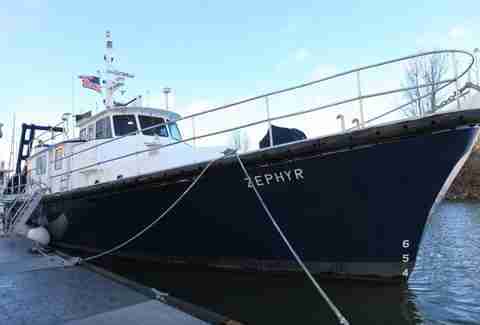 Not so much a houseboat as a full ocean-going vessel you can sleep on, the Zephyr’s got a killer story; it was once a workboat that retrieved deep submergence crafts and piloted cargo captains to their ships. As such, the quarters are basic, but with space for 10 people, it's a perfect kitsch crashpad after you hit all of Portland's strip clubs. Don't let Saugatuck's token Midwestern name fool you -- it’s a charming resort town on Lake Michigan with good beer and an artsy vibe. And this wooden barge is your Saugatuck home away from home. Comfy. Cozy. You can even take it for a cruise on the Kalamazoo River. 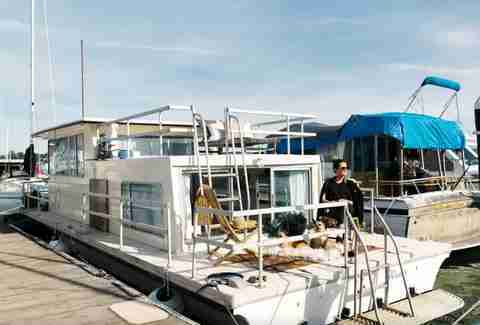 Apparently, the rare Lake Lanier houseboat with its own private dock, this three-floor beauty rocks a sweet rooftop lounge complete with water slides, diving board, and the kind of cool outdoor furniture usually reserved for trendy nightclubs. 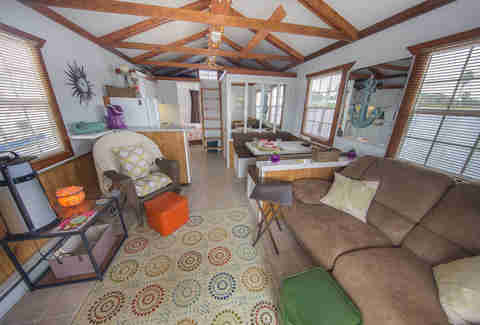 Located about 30 minutes from Austin on Lake Travis, this luxury houseboat is perfect for a weekend getaway. Besides five bedrooms across three decks, there's a hot tub, bar and grill (no, not a Chili's), and a rooftop deck with a water slide (!!). You can also order up a captain if you want to seize said day and actually take this bad boy away from the dock. The Rutabaga fully embraces its root-veggie name -- the interior is done up with warm and earthy decor, and the outside is even painted beige and purple just like a turnip. Which, incidentally, is the name of the host's OTHER nearby houseboat. Rebuilt from top to bottom (or bow to stern? ), it's homey and comfortable and comes with "a beautiful rooftop deck boasting enviable views downtown Seattle and Lake Union." Added bonus: the owner will even set you up with lots of legal cannabis and edibles for your stay (Washington, did we mention we love you?). Barbara Woolsey is a Berlin-based writer who just went houseboating in India. It was amazing. Read more about her travels on Facebook and Twitter.